The entries in a journal will all likely share some things in common, whether we’re keeping a record of our blood sugar, tracking the freelance stories we’ve submitted to various editors, our simply recording the events of our schoolday. 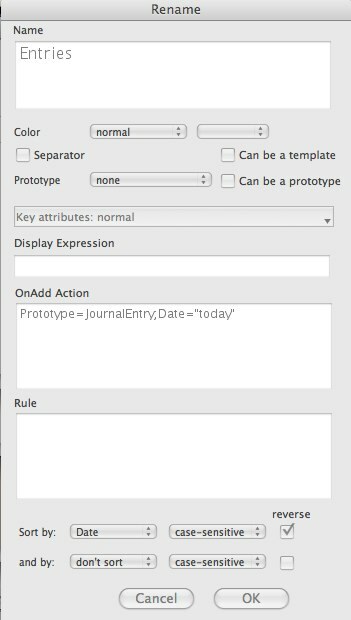 We can do lots more with prototypes, but let's keep it simple for now. Note that this doesn't mean everything in our journal is a JournalEntry — just that things moved into our journal are assumed to be journal entries until we tell Tinderbox they're not. While we're at it, we can also set the Date of the entry to “today”. 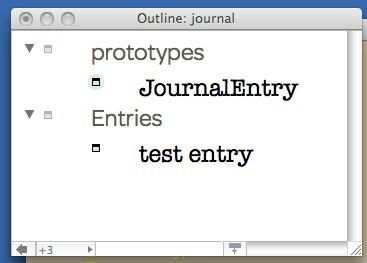 That means that anything we drag into our journal from other containers, or that we create inside our journal, gets timestamped and is assigned a prototype. We can thus add a journal to another project: our research notes for our next screenplay, for example, could contain a separate journal for reflections on the creative process. In just a few seconds, we’ve set up a journal with timestamps, automatic prototyping, entries sorted by date, and distinctive fonts and colors to distinguish journal entries from containers, metadata, and other stuff.